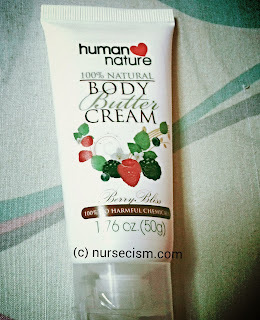 Packaging: ☆☆☆☆☆ (5stars) | Human ♥ Nature 100% Natural Body Butter Cream in Berry Bliss comes in a squeeze type tube. It is available in 50g and 200g. 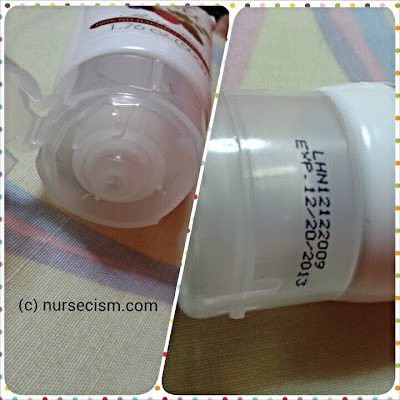 The cream is easy to get from the tube and it is so hygienic too! The tube contains all the needed info---one of which (probably the most important) is the expiration date. 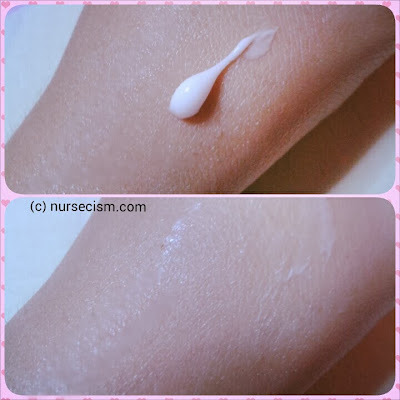 Consistency:☆☆☆☆ (4stars) | This body cream is so thick and creamy. It takes a while for the skin to absorb everything. There is a slight greasy after-feel. I would not recommend for you to use it if you're going to work or somewhere with a humid environment. Personally, I only use it during the night before going to sleep. Smell: ☆☆☆☆☆ (5stars) | It smells so nice and...yummy! There is a warning on their label though; "We know it smells delicious but control yourself. Do not eat." I find it quite funny. :p It's not overpowering. It is actually soothing and calming so it's perfect during bedtime. The scent even lingers upon waking up in the morning! Moisturization: ☆☆☆☆☆ (5stars) | It really makes your skin hydrated and healthy. It gives deep moisturization without clogging pores (because it doesn't contain modifiers!). The skin feels soft when you wake up in the morning. Overall Experience: 4.5 stars | If you are looking for a good body cream, this one is worth the shot. 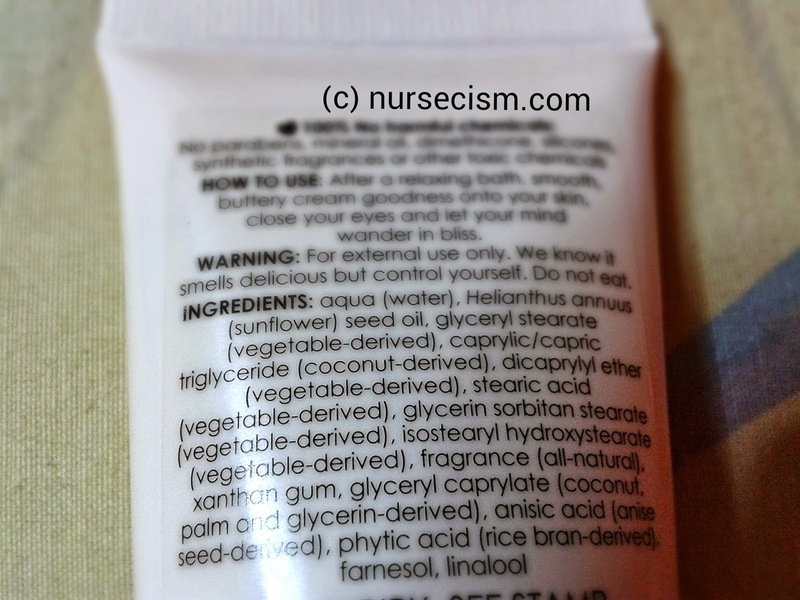 It gives what a body cream should without harming your skin. Plus, it is affordable! Packaging is cute and hygienic. Hydrates well and doesn't clog pores. Human ♥ Nature 100% Natural Body Butter Cream also comes in Mango Passion. Reading your review, this product looks perfect moisturizer for everybody. I always settle for baby oil or petroleum jelly..hehehe... Products like this is very essential especially during winter here in South Korea. Looks like a great moisturizer which has also nice packaging and scent. I've tried the human nature butter cream(mango passion) and I loved the smell. And you're right it really moisturizes your skin. In my case I have an asthmatic skin (eczema) this will happen every time I went inside to a mall and this cream helps my skin soft and smooth. Body cream with butter...Oh I liked this cream for my hands and feet. Great moisturizer for women's body. Very good review and it seems the product is a good one to try even sa boys. i use a body butter cream from body shop which i use for my daughter too. we totally love it and been using it fo ryears now. 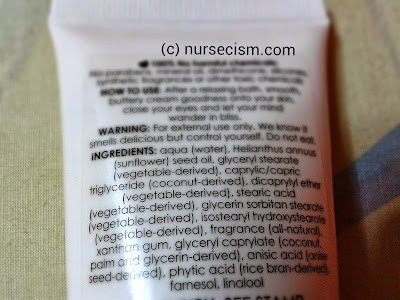 its true that this butter cream products moisturizes a lot.